Looking for cheap small van insurance? Thanks to price comparison websites, it’s now easier than ever before to get affordable cover for small businesses. 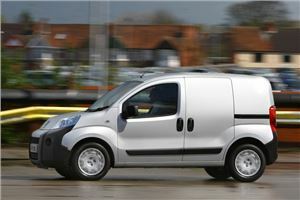 Honest John Vans has searched the market to find cheap comprehensive small van insurance for the carriage of own goods. Each quote is based on the details of a 30-year-old male builder who is single, owns their own business, lives in a town and parks their van on the street outside their home. To make the insurance quotes more realistic, the policy details are for a vehicle that covers 20,000 miles a year and has company signage on it. The builder in question also has their own public liability in force, 10 years no claims and no access to any other vehicles. 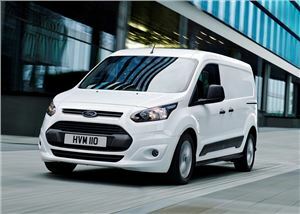 The Transit Courier is Ford’s smallest van; however, despite its compact dimensions, it’s still capable of carrying a standard Euro pallet. 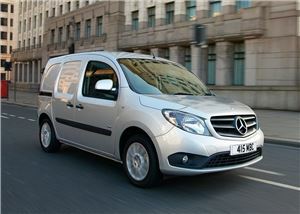 It also has longest load length of any small van at 1.6 metres. 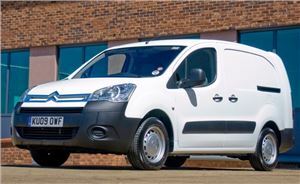 When it comes to insurance for builders, the Courier was the cheapest small van we received a quote for with a 1.5 TDCi 75 van in Trend trim coming in at £499 for fully comprehensive cover. The Citroen Nemo is another van that’s surprisingly small and practical. All versions will carry a Euro pallet and the passenger seat can be ordered with the Extenso folding mechanism to extend maximum load length up to 2.3 metres, which makes the Nemo a sound bet for many tradesmen. Specified with the 80PS 1.3 HDi diesel, a Nemo in LX trim came back at a flat £500 which makes it affordable when it comes to insurance. The versatile Berlingo is a great and inexpensive all-rounder, thanks to its comfortable interior and practical load bay. Our insurance quote is based on the L1 version of the Berlingo that offers a load length of 4.4 metres, while its 1.6 BlueHDi diesel engine will return an official 65.7mpg. What's more, with three seats, the Berlingo is extremely useful when it comes to transporting people, without compromising carrying capacity. 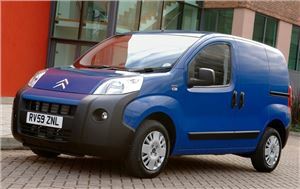 The Peugeot Bipper is identicle to the Citroen Nemo, but costs fractionally more to insure according to our quote. Like its French counterpart, the Peugeot version is aimed at builders looking for a vehicle that's easy to drive and easy to park. Thanks to the asymmetric hinged rear doors and the sliding side doors, the Bipper is also very easy to load and unload, even in the narrowest of spaces. 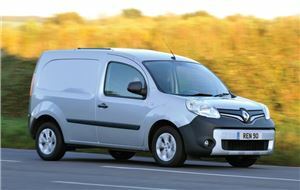 ﻿The Renault Kangoo Van is ideal for builders and has a load space of 3m3 that's user-friendly with neat touches such as a swivelling bulkhead and folding passenger seat that means longer items can be carried. There's also a useful optional roof flap that means you can transport things like ladders or pipes. Standard equipment levels are high too, with all vans getting DAB audio, side protection mouldings and a spare wheel. 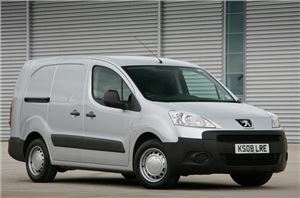 Based on the Berlingo, the Peugeot Partner is another van that majors on everyday usability. All versions have a load area width between the wheel arches of 1.2 metres and this means it can easily accommodate a Euro pallet. The Partner is one of the very few vans of this size that can carry three adults in the front. Thanks to the Multi Flex seating, there are two passenger seats plus the driver’s pew. 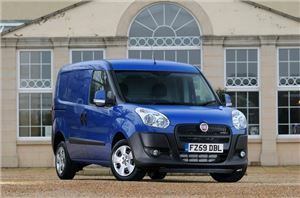 The value-focused Fiat Doblo is well-equipped and hugely capable. The load bay can take 3.4m3 in the standard model, rising to 5.0 cubic metres in the high roof version. Maximum payload varies between 750kg and 1000kg depending on which Doblo you choose. Insurance costs are affordable too, with the efficient 1.3 diesel 95PS returning a quote of £524 for one year's comprehensive cover. The Citan might not be the cheapest small van around - in fact it's one of the most expensive - but it does feel a cut above the competition in terms of quality and refinement. If you spend all day behind the wheel you'll appreciate the difference. Thankfully, its pricy nature isn't reflected in insurance costs, with our quote returning an affordable £530 for a 12 month policy against the compact 109 CDI panel van. The trusty Transit Connect is one of our favourite vans. On the road, the Ford drives like a good family car and it has space for plenty of cargo space with payloads peaking at 1000kg, There are some really clever details too, like folding front seats and a hatch in the bulkhead that make it easy to carry long planks and copper pipes. The 1.5 TDCI diesel was introduced in 2016 and strikes a great balance between performance and economy. 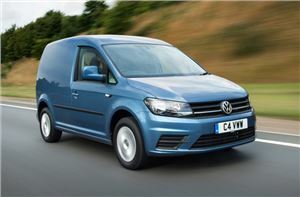 Being the most expensive van in our list, it should perhaps come as no surprise that the Volkswagen Caddy also boasts the highest insurance costs. However, the Caddy has lots of likeable features, with its refined ride quality and upmarket interior being its standout attributes. In standard form the Caddy has a load space of up to 3.2m3, which means even a SWB version will prove practical for tradespeople.